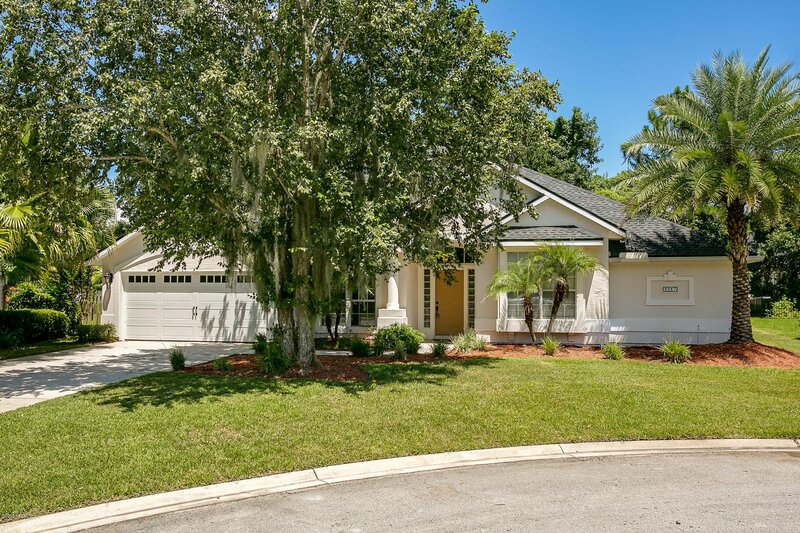 Beautiful Eagle Harbor home, situated on a private Cul-de-Sac! This spacious, single story home, has a desirable 3-way split floorplan and brand NEW ROOF! Quality features include; gleaming hardwood floors, crown molding, wood burning fireplace, an open family room w/ separate living & dining rooms. The expansive kitchen, with center island, features 42' white cabinetry and includes stainless steel appliances. The spacious Owner's Suite w/a private entry to the lanai and ensuite w/ dual closets. Relax on the covered/screened Lanai or play in the privately fenced backyard! This Home is a must see! Enjoy Eagle Harbor amenities, featuring; a clubhouse, golf course, 3 Swim parks, tennis courts and more! Convenient to Shopping, Top rated schools and NAS JAX! Move-In Ready! No CDD, only O&M! Listing courtesy of ROUND TABLE REALTY. Selling Office: RE/MAX UNLIMITED.